I am seduced by my chosen medium of clay, but what really drives my art is a desire to communicate. I am fascinated by the challenge of transforming an abstract idea into a concrete visual image that touches people emotionally. Pictured Above Left: "Mother, Daughter, Artist, Wife (self portrait)" 1997. Stoneware with underglaze and china tea set 19”X20”X17”. Jane Kelsey-Mapel is a Phoenix based studio artist. She exhibits her figurative ceramic sculpture nationally and was represented by Victoria Boyce Gallery in Scottsdale, Arizona. Her work has been purchased for numerous public and private collections including the Kamm Teapot Foundation of Sparta, North Carolina and the City of Phoenix Collection of Contemporary Arizona Ceramic Art at the Phoenix Airport Museum. 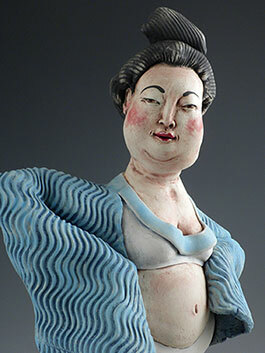 The Chinese publication, Sculpture Magazine, and the U.S. publications, Ceramics Monthly and Phoenix Home and Garden have featured Jane's sculpture. Her work was also published in the book The Sculpture Reference Illustrated. An Arizona native, Jane grew up in Tempe, Arizona where she completed a Bachelor of Arts degree in art at Arizona State University. 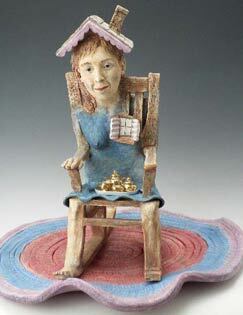 She earned a Master of Fine Arts degree in ceramics at the University of North Texas. A dedicated art educator, Jane has taught all ages from seniors and young adults in the community college to children in the Youth Academy of Scottsdale Artists' School. She has taught both full time and part time at universities and colleges in Texas and Arizona over the past thirty years. She is currently teaching ceramics at Glendale Community College in Glendale, Arizona. As well as teaching and her studio work, Jane has created award winning public art. Through her work as an Artist in Residence at local schools, she has created large scale tile mural installations. One of these projects, the Madison Simis Reading Garden in Phoenix, was awarded the prestigious Crescordia Award from the Valley Forward Association. These projects were funded by grants from the Arizona Commission on the Arts, the Phoenix Office of Arts and Culture and school Parent Teacher Organizations. In 2007, Jane worked with college students to construct a twelve foot tall abstract horse sculpture inspired by one of her porcelain horses. The tiled concrete and steel sculpture is permanently installed on the plaza of the Center for Performing Arts at Paradise Valley Community College (PVCC) in Phoenix, Arizona. Grants from the Maricopa Community College District and the Arizona Community Foundation funded this project along with support from PVCC. 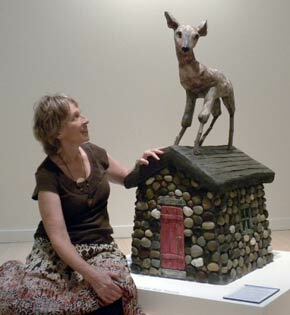 Pictured Above Right: Jane Kelsey-Mapel shown above with "Secure in the Wilderness." One of my favorite ways of teaching is to present workshops on my ceramic sculpture techniques. I have given many hands-on and demonstration workshops at art centers, universities, colleges, high schools and private art schools in Arizona, California, Texas and Washington. At the 2009 National Council on Education for the Ceramic Arts annual conference in Phoenix, I presented a slide lecture entitled "Using Concrete Over Rigid Foam as a Sculptural Base for Mosaics." Please contact me if you are interested in inviting me to present a workshop and I will send you further information. Pictured at Left: "Bathing Beauty Cups" 2008. Porcelaineous stoneware with underglaze and glaze. I will be teaching a three-day hands-on workshop Hollow Built Figure Sculpture and Kiln Fired Surfaces at Scottsdale Artists' School Friday and Saturday, December 6 and 7 and Saturday, December 14, 2013. This is an all levels adult class that meets 9 a.m.–4 p.m. Tuition is $395 with a $35 glazing/firing fee. Note that the school offers a limited number of tuition scholarships. Course Description: During the first two days of the workshop, students will work in water-based clay using traditional hollow building techniques. They will roll out and assemble slabs of clay to create small-scale heads and torsos that will be dried and bisque fired in the kiln by the following Saturday class. No models will be used. Students will be encouraged to work loosely, focusing on responding expressively to the clay as it takes on form and gesture. Demonstrations and individual critiques will take place throughout the workshop and Jane will show slides of a wide variety of fired clay figurative sculpture. On Saturday, Dec. 14, Jane will discuss different types of fired surfaces, their application and firing processes. Students will then apply under-glazes as translucent washes and stains to their pieces. These surfaces will become permanent when they are glaze fired the week after the workshop. Students may pick up their finished pieces from the school or arrange to have them shipped. After a successful yearlong collaboration with Tacoma artist Becky Frehse and debut of our work in Seattle and Tacoma galleries, we are preparing to exhibit our work in Arizona. The show will open at the Phoenix Airport Museum in April and run through September 2013. Becky and I were college roommates and have remained close friends every since then. She is a wonderful painter and has been working in relief with paint, collage and found objects. We were both looking for something new and fresh in our art making process. We thought, “sometimes two heads are better and more fun than one.” So why not put our heads together and see what happens? The result was a collection of mixed media pieces exploring themes of the collaboration process itself and the idea of reinventing yourself at various stages of life. Read more about our collaboration on our blog at www.janeandbecky.wordpress.com and on our website www.reconfiguredart.com. 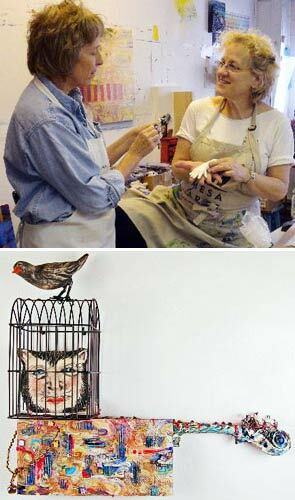 Pictured Above Right – Top: Becky Frehse and I working in her Tacoma studio, July 2011. Bottom: “Turning the Tables”, stoneware with underglazes, acrylic on board with violin neck, wire cage, wire and bell, 20"x22"x6" (our first finished piece). Web Design, Images & Text © 2008–2014 by Jane Kelsey-Mapel.